—Chris Gerling, Extension Associate in Food Science, New York State Agricultural Experiment Station, Geneva, N.Y., in Dec. 21 story in the New York Times about the growing popularity of Northeast microdistilleries, Just Don’t Call It Moonshine. From the College of Agriculture and Life Sciences. 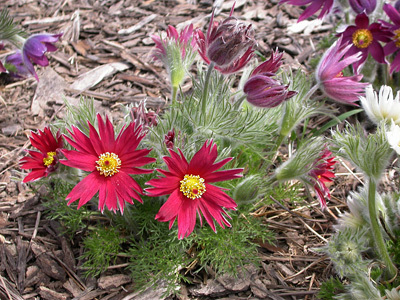 Foliage of Pulsatilla vulgaris ‘Papageno’ provides cover after the bulb foliage fades. A Dec. 21 online article in the Cornell Chronicle, Winning partners in bloom: Research pairs spring bulbs with various perennials, features bulb- perennial combination research conducted by Bill Miller and the Department of Horticulture Flower Bulb Research program. One drawback of spring-flowering bulbs is that some gardeners find their fading foliage unsightly. 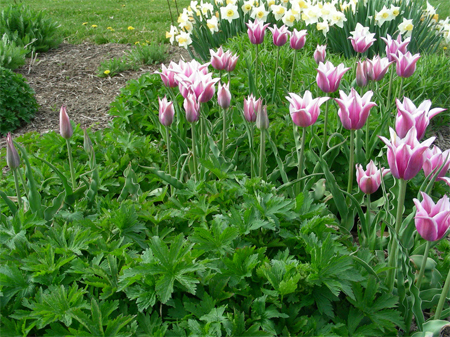 Miller’s pairings take into account not only how colorful spring bulb flowers can complement emerging perennial foliage, for example, but also how maturing foliage can mask the fading leaves of post-bloom bulbs. Foliage of Geranium \’Mayflower\’ makes the blooms of Tulipa ‘Ballade’ look as if they are floating in a sea of green. The foliage and purple flowers of the geranium later mask the old tulip leaves. Conference Room 102, Mann Library, Cornell Campus, Ithaca, N.Y.
Visit the Cornell Soil Health website. Broaden your understanding of organic techniques for all kinds of gardens, including vegetables, fruits, flowers and ornamentals, and lawns. 8-week course starts Jan. 31. We embed this philosophy of public scholarship throughout our entire process whether it’s education, research or outreach. I think I’ll use Horticulture as a really good example of programs where there is true clarity from the point of fundamental discovery up through problem-solving — not only research, but outreach. For example, if have visited New York City and you have enjoyed urban trees, you have enjoyed the benefits of some of the work of Nina Bassuk in the Department of Horticulture where she studies and understands how trees and other plants can thrive in urban settings, which certainly makes those settings much more pleasant for all of us. We have a chair in that department, Marvin Pritts, who still personally delivers outreach programs for those who are interested in growing berries, whether those are at the individual level or the larger level. And we have students who work with both of those faculty members to ensure that not only will they carry this information on to the next generation as they enter their own careers, but they can also enact a lot of their work in practice at the time. So I think our Horticulture Department really embodies that philosophy of the Land Grant spirit. 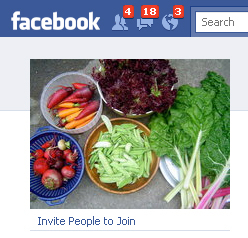 The Cornell Vegetable Varieties for Gardeners website now has a Facebook group. Launched in 2004, the site has grown to more than 5,000 registered users. 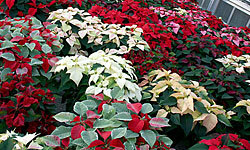 Visitors will find descriptions of more than 6,000 varieties, find seed sources, and read reviews by registered users. Also just released: the 2011 Selected List of Vegetable Varieties for Gardeners in New York State, which lists varieties New York gardeners have had most success growing. If you have questions or feedback, email: vegvarieties@cornell.edu. 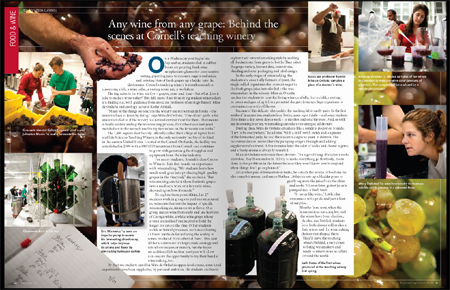 Teaching winery in Ezra magazine. Thinking of staying in Ithaca this summer? Interested in organic vegetable production and student-run farms? Looking to get your hands dirty and become more involved in the local food movement on campus? If so, apply to be a Market Garden Manager at Dilmun Hill for the 2011 season! The Market Garden position at Dilmun offers managers a hands-on and self empowered learning experience in sustainable agricultural production. Managers develop a close relationship with the land of Dilmun Hill. See the 2011 Market Garden Manager Application and a job description for more information. Mail applications to me (Ryan Devlin at rmd96@cornell.edu) by 4 p.m. January 28th 2011. Feel free to send any questions about the job or application my way! … always wished that you could be more proficient at drawing? … been looking for an opportunity to unwind by finding a new avenue to express yourself creatively? … simply not enrolled in a drawing class because of a lack of opportunity or your busy schedule?